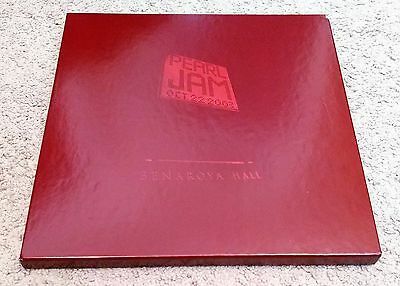 Up for auction iseasily my favorite Pearl Jam recording, from their 2003show at the Benaroya Hall in Seattle, WA. This comes in a 4LPset and waslimited to 2000. For PearlJam fans,many consider this to be one of the most coveted pieces of memorabilia out there. This one is #1475 and, while unsealed, has never been played. It does have a small scuff on the front upper right hand corner (see pic 1), but with this exception, I strongly believe most would consider this to be in brand new condition. I'm happy to send additional pics for serious buyers. Did not take out the sleeves to photograph as honestly, they have never been taken out. You may be asking yourself, why is this unsealed, but never played? Awhile back the wife and I were drinking the night away. She went on a rant about how I keep certain things sealed. As part of this rant, she tool the seal off this record set. I've been unable to play it since. Rather than have this as a lingering memory, I'd like to offer it up in an attempt to create new memories. S&H will be calculated based upon your location, and is based on USPS Priority Mail rates (tracking included). Insurance is also highly recommended. This will be carefully handled and will be very carefully packaged to ensure safe transit. I also combine shipping on multiple orders. Payment from winning bidder must be received within24 hours of auction end. Seller accepts PayPal ONLY! Will ship product Worldwide, but please ask about shipping to international destinations. No refunds.